"All of this has happened before and will happen again." The second season of Battlestar Galactica included a captivating three-episode arc that introduced the Battlestar Pegasus and its crew. Following a striking cliffhanger ending to the Pegasus episode, the two-part Resurrection Ship developed some nasty conflicts between the leaders of the two ships. Following these stories, key questions remained about the new arrivals. The fleet now had a second battlestar, but would the two crews be able to collaborate effectively? When had some Pegasus crew members lost their compassion and humanity? How did their experience differ from that of the Galactica crew? Those three episodes gave hints about the past but didn�t delve closely into their experiences. During the lengthy hiatus before the fourth (and final season), Executive Producer Ronald D. Moore, Writer Michael Taylor and the series� entire creative staff have provided us with the opportunity to answer some of these riveting questions. 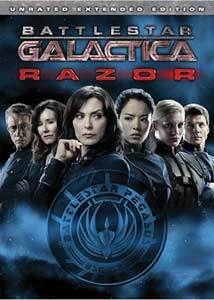 Battlestar Galactica: Razor is a feature-length episode that covers three connected stories from the show�s past. The most prominent segment is the Pegasus story, which follows the path of two major characters. One of the show�s most convincing guest performers was Michelle Forbes, who brought tremendous weight to the role of Admiral Cain. As the leader of Pegasus, she believed in the idea of sacrificing people for the greater good and did not tolerate questions of her authority. Beginning with memories of the original Cylon attack, this film supplies clear reasons for Cain�s vicious actions. While staying hard-nosed, Forbes reveals an emotional side to Cain that is gone by the time they reach the Galactica. In this film, Cain advises young Kendra Shaw (Stephanie Jacobsen), who emulates her mentor�s strict cruelty following the attack. Their bond carries over into the next section, which involves Lee Adama�s (Jamie Bamber) first mission while commanding the Pegasus. Now serving as his XO, Shaw�s closeted demons could lead her into desperate territory. The final (and least essential) plotline involves flashbacks to Admiral Bill Adama (Edward James Olmos)�s experiences during the first Cylon war. Although much of this segment was cut for the television airing, it has an important connection to the later mission. Actor Nico Cortez takes the role of the young Bill Adama and gives a credible performance. This movie is so plot-heavy that I could spend pages discussing all its intricacies. Although it should be entertaining for new viewers, the rewards will truly come for dedicated fans. Key individuals like the Adamas and Starbuck (Katee Sackhoff) receive considerable screen time, while others like Baltar (James Callis) and Roslin (Mary McDonnell) make brief cameos. We also see more of Pegasus crew members like Colonel Fisk (Graham Beckel), who show a less-corrupted side. Viewers who enjoy Battlestar�s unique space battles won�t be disappointed to see more remarkable footage. The series� high production values remain strong. Director F�lix Enr�quez Alcal� has filmed numerous television shows and brings his talents to this feature. He directed the two-part Exodus during season one and hasn�t lost his ability to maintain the series� look. The young Adama sequences are especially strong and showcase a striking aerial fight involving an old-model Cylon. It�s unfortunate that those scenes were severely cut for the television airing, but they have been restored for the DVD release. Battlestar Galactica�s fourth season is scheduled to premiere next spring, barring any disruption by the ongoing writers strike. Razor might not be required viewing before the next season begins, but it does include one astonishing revelation near its conclusion. If this disclosure about a key character is true, the Galactica crew may be headed unknowingly towards a dire fate. This excellent teaser is one of many wonderful aspects of this film, which continues the winning run of the best series of television. Image Transfer Review: Razor offers an exciting 1.78:1 anamorphic widescreen transfer that matches the high quality of the previous series releases. As usual, much of the action occurs on ships dominated by colder tones, but the picture still leaves a strong impression. And the rare brighter moments don�t disappoint, which leads to an excellent visual show. Audio Transfer Review: During the action-packed space battles, the success of the 5.1-channel Dolby Digital transfer shines through and delivers a powerful experience. Considering the series� limited budget, the sound effects play a key role in generating a believable atmosphere. The audio helps to create an immersive feeling that resonates well during this movie. Extras Review: Razor offers an interesting selection of extras that should please the series� many fans. The most prominent inclusion is a commentary from Executive Producer Ronald D. Moore and Writer Michael Taylor, who provide great insights. They pack considerable information into the track while retaining a conversational tone. Moore always has plenty to say about the show, positively and negatively, and this feature is no different. It�s intriguing to note the major shift from the film�s original concept to the completed film. Plotlines were scrapped and shifted to entirely new places to tell a much-different story. Taylor also gives compelling material about writing the script and the collaborative efforts of the entire creative team. This release also contains two deleted scenes that supply more worthy material on Lee Adama�s psyche. The first scene takes place in the tent on Caprica, where he talks about problems with his father. The other involves Starbuck and reveals his continued obsession with their destruction of the Olympic Carrier. The total running time is less than four minutes, which is a bit disappointing, but it�s still a nice feature. The Look of Battlestar Galactica describes the original ideas for the show�s visual style. Moore and Production Designer Richard Huddin appear to speak about an approach that contrasts dramatically with other science-fiction series. My Favorite Episode So Far gives Moore and the actors a chance to talk about their favorite episodes. A popular choice is the Season 1 premiere 33, which depicts a methodical, dreary pursuit of the fleet by the Cylons. Viewers who can�t wait for Season 4 also get a sneak peak at the major events in a quick two-and-a-half minute feature. Moore speaks about the purpose of Razor, and others like co-creator David Eick offer quick glimpses about possible Starbuck revelations. There�s also a quick trailer, which has some actual footage from the upcoming season that promises to be exciting. Finally, this disc includes the seven minisodes that originally were released on the Internet. They focus on the exploits of young Bill Adama during the first Cylon war and showcase high production values. A majority of this footage was incorporated into the extended DVD edition of the film, but it�s still great to view it as a separate chronicle. Battlestar Galactica: Razor delivers on its promise to expand the series and reveals the unlimited possibilities of this outstanding drama. If this is your initial exposure to this remarkable show, you might be confused, but don�t give up now. You still have time to catch up with the first three editions before the final season begins.